WheelTurnerHawaii.com: A SUCCESSFUL Homestead Hill Bomb. "Today went over terrifically! There were no hiccups and the heats all ran smoothly. We nailed a prefect window of weather, with rain before and not too long after the event. Thank God for opening that window for us. Congratulations to everyone who placed, if you didn't there will be a next time! So practice hard! Everyone ripped out there today, pushing themselves further than they ever had, and some of us have the scrapes to prove it. I want to personally thank all our volunteers, without them this event would have fallen apart! Thank you for taking part in this growing sport here on the island! I want to thank all our sponsors, Sector 9, Penny skateboards, Bones, These wheels, CALIBER TRUCK CO. and Eighty Two creations for your help and cooperation with this first time event! 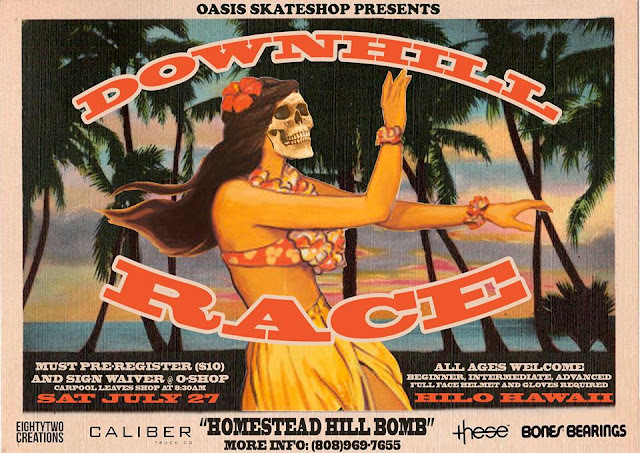 A huge Mahalo to OASIS SKATEBOARD SHOP and Mad Dansen for your help in organizing, without you it wouldn't be what it was. A final thank you to the supporters who live on Kaiwiki Homestead, thank you for waiting and maybe saving someones life, and big thanks to the man John Fitzgerald for hooking us up with some straw bales that definitely cushioned a majority of the falls. Thank you all for coming to the first edition of the Homestead Hill Bomb, more to come next year, maybe sooner. A hui hou, til next time shredders. (full writeup coming soon)"
Chee! Im stoked everything was successful over on the Big Island this past weekend. The Hawaiian Islands downhill skateboarding scene is becoming what it should be! Congrats to all the racers who placed, and a BIG MAHALO to Brian for organizing!